If it IS broke, let US fix it! 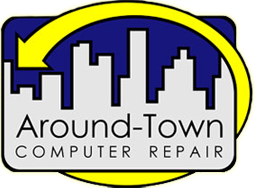 At Around-Town Computer Repair we know just how frustrating it can be to have a computer that isn’t working properly, so the last thing you need is frustrating customer service. This is exactly why we make sure to deliver top-of-the-line, individualized service for each of our customers. We have built the company with integrity, compassion and our clients in mind. We will even come to you to fix your computer, whether that be in your home or office, in order to make servicing you less of a hassle. At Around-Town Computer Repair some of the things that you can expect are top-of-the-line service, integrity, personal attention and a smile. We know that at the end of the day you simply want great service for a reasonable price. So no worries, your customer satisfaction is on us! Call us today at 559-589-9100 or visit us at 213 N. Douty Street so we can help you now and in the future as well.